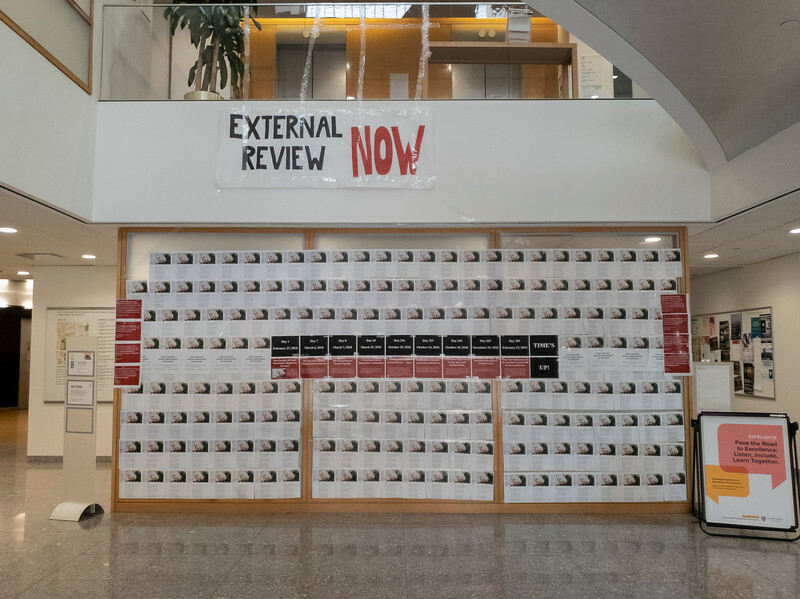 The Center for Government and International Studies lobby was covered with printed copies of the original Chronicle of Higher Education article about Professor Emeritus Jorge I. Dominguez. The posters accompanied a protest calling for an independent review of the allegations against him. Exactly one year after 10 women publicly accused Government Professor Emeritus Jorge I. Dominguez of sexual misconduct, Government students reiterated their demand for an external review of the allegations in a protest and a letter to University President Lawrence S. Bacow. More than 70 students — clad in black clothes and holding signs reading “Time’s Up” and “External Review Now” — rallied in front of Massachusetts Hall Wednesday afternoon to criticize Harvard’s response to the allegations. 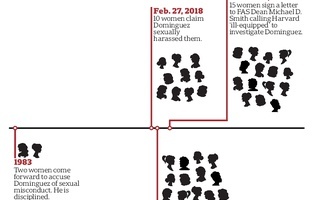 The Chronicle of Higher Education first published the accusations in February 2018, and subsequent reporting by the Chronicle revealed that Dominguez faced allegations of sexual misconduct from 18 women, stretching back as early as 1979 and as recent as 2015. The University opened a Title IX investigation into Dominguez in April 2018, which is ongoing. 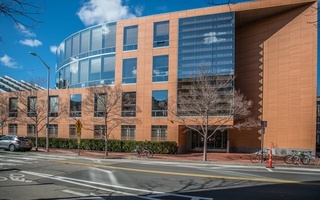 Before the protest, a group of graduate students in the department emailed the letter to Bacow, demanding a “public” commitment to an external review and a “feasible timeline” for the initiation of such a review — without which they say students remain at risk of experiencing instances of misconduct like those Dominguez allegedly perpetrated. “A year after this egregious pattern of abuse was revealed, we continue to have little hope of understanding the institutional and cultural factors that made Domínguez’s actions possible, and therefore little prospect of identifying what must change for justice and accountability to prevail in the future,” they wrote. The graduate students partnered with Our Harvard Can Do Better, an undergraduate student group dedicated to anti-sexual assault advocacy, to organize Wednesday’s rally. The same day, students wore black to Government classes to draw attention to their effort and postered the walls of the Center for Government and International Studies Knafel with printed copies of the Chronicle article. Sarah S. Fellman ’18-’19, a Government concentrator and a member of Our Harvard Can Do Better, said at the rally that Harvard’s response to the allegations against Dominguez “makes it clear that internal procedures have failed us time and time again." "Any further delay in a comprehensive external review is not only justice denied for those who have come before us, but also leaves current and future members of our community actively at risk,” Fellman said. “Let me repeat that: we are actively at risk in an environment where we know sexual harassment is all too common." Government department chair Jennifer L. Hochschild wrote in an emailed statement Wednesday that she and her colleagues “applaud” the students’ efforts and will continue working to improve departmental culture. 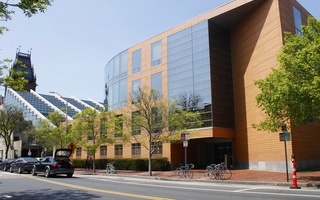 She added that though many Government faculty members support an external review, University administrators informed them that Harvard will not initiate such a review until the investigation into Dominguez concludes. “In the meantime, Gov faculty, students, and staff are hard at work in developing policies and practices to improve the departmental climate and institutions,” she added. In recent months, Government students have become increasingly impatient with the investigation’s perceived slow pace and secrecy. Speakers at Wednesday’s rally noted the probe into Dominguez has lasted significantly longer than the average length of investigations conducted by the Office for Dispute Resolution, which looks into formal allegations of sexual misconduct at Harvard. The average length of an ODR investigation in 2018 was 3.5 months, and the longest investigation of the year lasted 4.4 months, according to a December report. The investigation into Dominguez has lasted nearly 11 months. Typically, the University opens one ODR investigation per Title IX complaint and either party can appeal the result. 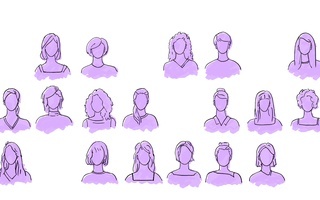 University affiliates first called for an external review conducted by an independent body in March 2018, when 15 of the accusers urged the University to create an “independent commission” to conduct such a review. 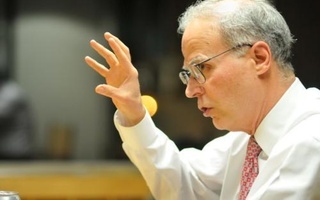 They argued the commission was vital to examining the institutional deficiencies that allowed Dominguez to maintain his position as a faculty member even after administrators first learned of harassment allegations in the early 1980s. In an October letter to Bacow, graduate students set a deadline of February 27 — the one-year mark of the first Chronicle article — for Harvard to commence an external review. Dominguez Accusers Call Harvard 'Ill-Equipped' to Investigate Prof.